Why is the OMNI Blender V cheaper than its competitor blenders? The OMNIBLEND V 3 hp Blender is really a $500 + dollar blender. We do not want to sell it for more. We are a consumer direct distributor of the OMNI V Blender. We have reduced the price to $279 including FREE shipping to get more buyers quicker and start earning your honest feedback. People want to know from others what this blender is like. Remember, we are giving you a full 30 days money back return guarantee if you are not satisfied with this blender. We are extremely critical with the blender that we offer. We have tested and reviewed in the past many different blenders thoroughly. The OMNI Blender is an Energizer. It is also a saving machine that can blend everything you need to micronize and to blend it into smoothies, paste, puree, ice cream, peanut butter, soup, etc. How much HP (horsepower) does the OMNI V have? The OMNI V Blender has a 3 horsepower motor. Because the motor is an energy efficient (latest technology) motor, it saves power. It also cools better, lasts longer and runs significantly quieter. The RMP's are little slower than in the 3 hp commercial competitors' blenders. The OMNI V still has a 3 hp torque, enough to micronizing smoothie-ness when compared to the blending outcome of other 3 hp blenders. It out-performs most other high performance 3 hp blenders. This actually leaves much reserve that leads to motor longevity (it will last longer). What is the Warranty of the OMNI V Blender? As of February 1, 2011 (after having sold the OMNI blender for about 1.5 years) we have been satisfied sufficiently with its performance and quality, so we raised the warranty to a full 7 years. This covers material defects and associated labor, and shipping of the blender motor. You probably should read the Warranty information so you understand it before making a claim. Are there other Blender Jars or Containers that can be used or fit onto the motor base of the Omni Blender? Yes, certainly, there are a few different brands that make similar blenders and/or parts and/or containers. This means that theoretically, some parts of one kind of a blender may fit onto another one. The mere fact that some parts may fit onto one or the other smoothie blender, is not a prohibited activity. The consumer may retro-fit parts and components at his/her OWN discretion as long as you know and understand that there are certain risks involved. First, one or the other, or perhaps all affected parts and/or components retro-fitted are not tested in that order for safety. Therefore, any of the affected parts and/or components covered by a manufacturer's warranty may actually then not qualify for any kind of warranty coverage anymore. We will not tell you you which parts may or may not fit. It is not our intention to inter-change these parts. If you explore the possibilities of retro-fitting fore example another competitor's jar to fit the Omni Blender or the other way around, or a blade, etc... you, the consumer are hereby notified that you assume any and all responsibilities and liabilities if you mix up different brand products and components. Can I buy a BPA-Free container? YES! All our blenders are coming with the BPA-FREE jar! Can I buy a bigger container instead of the 50oz one that comes with it, a 2 liter container? Actually, the 50oz OMNI container has room for up to 2 liters / 2 quarts / 64oz of liquid or content. The standard container that comes with the OMNI Blender is a 64oz Co-Polyester BPA-FREE jar with a multi-function blade. The measuring markings on the container are up to 50 fl oz. Is a glass container available that fits on this OMNI Blender? Not yet. We are working on a design that is not easy to break, or in other words, the glass material will be unbreakable. The main reason, so the competition states, for not using a glass jar is that the High-Power Blenders are so powerful that the glass would or could break during blending operation. We really want to disagree with this statement. In today's time technology can produce a glass jar that will not break. Plus, the real motivation for many factories is actually their bottom line dollar or profit. Plastic is lighter to ship and cheaper to produce. Therefore the very often propagated misinformation about the reasons for using plastic over glass. Please note, although that we are working on a glass jar, it still can take a long time to come out with one. We may never come out with one. We suggest you don't hold off with your purchase decision. The next best thing is the Co-Polyester BPA-FREE jar, which comes with every blender purchase anyway. How long has the OMNI Blender been around? The OMNI Blender has been around since the mid 90's (1995), sold in over 60 countries, mostly in Europe. It has been sold on a more commercial level because of its heavy duty application and has not been advertised very heavily here in the USA. OMNIBLENDER.COM, LLC has been selling many units since November 2009 and has not received any complaints about the durability or workmanship. Of course there are always some warranty issues or claims with anything. That is why a good warranty is provided. We stand behind our products! Are there customer feedback reports about the OMNI blender? What do customers say about the OMNI Blender? We are receiving more and more feedback from customers of how satisfied they are with the OMNI blender. In the past there were not too many customer feedback reports available though. We have a few links where customers started to share their experiences about the OMNI blenders. Remember, if the OMNI blender would be a crappy blender, we would not sell it. It is for us really a thing of reputation. See what other people are saying about the OMNI Blender. Where is the OMNI Blender manufactured? The OMNI JTC Blenders are made in China, although the Headquarters (JTC) is in Taiwan. The factory is an ISO 9001 certified facility with the latest state of the art equipment and engineering, all from German and Swiss origin. Proof of that alone is the high grade stainless steel used in the blender components and the 3 hp self-compensating energy-efficient motor. Compared to the Montel Health Master Blender, the OMNI Blender is 100% better in quality, workmanship and will outlast the Montel Health Master blender 5 to 1. Even some other competitors claim USA-produced blenders but their blades are from CHINA (when you turn it over, it shows the insignia "China" on it) suggesting it might also be made in China, and probably also other components. Who do I contact if I ever have a problem with this 3 hp blender? You may contact us, OmniBlender.COM, LLC. We will take care of your warranty and service needs, returns, repairs, accessories, upgrades, etc. Are recipes available with this blender? There are hundreds of thousands of recipes available for raw food, paste, hot soup, smoothies, juices, drinks, ice cream, peanut butter, etc. right online, even the competition has recipes available online. Just because you may have seen the Montel Health Master Infomercial does not mean you really need to have specific recipes for this blender. This high performance blender, like the rest of them, the Montel Health Master excluded, blend any and all kind of recipes, as you want them too. What ever you put it, it will blend it, of course within its reasonable limits, just in case you are planning on grinding down granite rocks. You can do it however not without damaging the blender. What you see in infomercials is for show. They don't show you all the true facts. Caution there! Can I make fruit and vegetable juice with the OMNI blender just like with the Montel Health Master Blender? Yes, you can make any juice, smoothie, soup, paste, butter, ice cream, etc. with the OMNI Blender, and even better and much faster than with the Montel Health Master Blender. It takes about a good 1/2 minute / 30 seconds to blend hot soup (starting out with hot water from the faucet already). You can then opt in to keep blending for richer nutritional finesse or stop at 30 seconds. The soup should be over 100 degree Fahrenheit anyway because otherwise you might as well just cook it on the stove and kill all the nutrients with the high temperature. You can make ice cream in about 20 to 30 seconds with the OMNI V blender by putting fruits on the bottom and ice on top. The use the tamper tool that we provide and push down on the ingredients while blending on high power, using the 35 second timer. You can make vegetable paste or sauce with garlic by just putting all desired ingredients into the container and putting the blender on high with the 60 second timer. You can make your favorite fresh raw vegetable smoothie in 30 seconds or less. In what color is the OMNI Blender available? 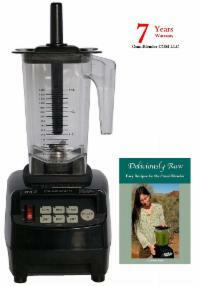 The OMNI V Blender is available in Black. It is made in Black and an Olive Gray, but we only sell the Black color because it is a more popular color. Can I return the blender if I do not like it? Yes, you have 30 days from the purchase date to try out the blender and to return it. You can send it back if you are not happy with it. We encourage you to dig in and use it daily. Only when using it you will get to know all fun and exciting recipes, and your favorites. Remember, most people that make a 400 to 500 $ kitchen appliance purchase and will not even use it. I just bought a competitor's blender still in the box from someone here in Utah who has never used this blender. For crying out loud, the blender was like 4 years old and has never been used. USE IT! PLEASE! It might be good for you too! Is the OMNI Blender safe? Yes, the OMNI blender is completely safe to use for recommended blending activities of sauces, smoothies, puree, nut butters, ice cream, etc... UL LISTED. Warranty Questions: Go to our Warranty site for the OMNI blender.